Immersed in the rolling Hertfordshire countryside, Manor of Groves Hotel, Golf & Country Club is one of the most popular destinations for short golf break in the Southeast. The picturesque golf course features two contrasting loops of nine holes, making for exciting play and an excellent golf break. Located just a short drive away from London, the Manor of Groves Hotel is a pleasant blend of traditional and contemporary styles, with a range of gorgeous bedrooms to ensure you have a comfortable stay. For special occasions, the old wing of the house is home to several beautiful four-poster suites that offer that extra level of luxury. Book a Last Minute Deal at Manor of Groves Hotel, Golf & Country Club now from £89.00pp! 1 in 16 goes free! In recent years there has been continuous and dedicated investment to improve the standard of the course and its condition, adding to the already impressive golf experience. It is fair to view the course in two distinct halves, as the front nine weaves its way around the old manor gardens, while the closing stretch is more open and undulating. 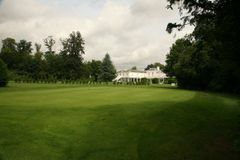 The stunning Hertfordshire countryside is the perfect backdrop for a beautiful course, where the awkward positioning of many raised greens makes choosing the right club tricky at the best of times. The pleasantly demanding course is a highlight of this excellent resort, where a golf break will certainly be memorable. The newly established viewing gallery gives visitors the chance to watch their fellow golfers tackle the testing closing hole. If you need to arrange a corporate or society event, the Manor of Groves has conference and banqueting facilities to cater for up to 500 delegates. The inauguration of the new part of the hotel has added a large number of good-quality guest bedrooms, which are spacious and comfortable. Notable features include flat screen televisions with free view, broadband internet access, hairdryers and marble bathrooms. The two wings are linked by a striking glass atrium, which serves as a focal point for guests visiting the Manor of Groves on a golf break. The Manor of Groves Health Club is a state-of-the-art facility, including a 20-metre swimming pool, steam room, spa, sauna, solarium, aerobic studio and a fantastic three-tiered gym, which is fitted with the cutting edge Technogym key system. For those wishing to be pampered, there is a good range of Thalgo health and beauty treatments on offer. The comfortable atrium is home to the stylish brasserie and bar, where guests can enjoy international cuisine or a well-deserved drink. I think this course needs to be played a few times to get the feel of it. To be fair though, the conditions we played in, mid March, where we had gale force winds and hailstones, probably didn't do the course justice. The fairways were amazingly well kept. We couldn't believe the condition with all the rain we'd had. There are some very long holes and there's not an easy Par 3 on the course. Enjoy hole number 1, as this is the easiest par 3. To be fair though, in less hurricane conditions, the par 3's may be a touch easier. So my experience may be a little skewed, so don't let it deter you from giving it a go. We will definitely be returning for another crack. Enjoy! !